Sorry for no updates on 4wd. It was a very tough 3 days, and I was just exhausted. Practice day was crazy. We had 10 practice runs, but I only was able to finish 3 of my runs, so I missed out on a ton of track time. I was just having really weird mechanical issues. My car felt ok, but I really lacked steering in the 180 degree corners. I was making setup changes all day, but I wasn’t getting enough track time to really see what it was doing. Qualifying day. The morning practice my car actually felt pretty good. I was placed in the A resort heat, even though I only did 1 lap in the seeding practice. That was a good and bad thing. I would always start in the back and then have to pull over and let the faster cars go by me. Once qualifying started, I thought I would be able to get some good runs in, but it just didn’t happen. I wasn’t comfortable, and I was still having small mechanical issues. My electronics just felt weird. In Q3 I was actually going really good and was looking at getting a 6th for the round, but with 1 minute to go, I brushed a pipe and caught my wheel nut on a coupler. Front arm broke and the drive shaft came out, so I drove the last minute with 3 wheel drive. I got a 41 for the round, that was my best score all qualifying. In Q6 the electrical gremlins finally showed themselves. It was a shorted out speedo the whole time. I ran the whole Q4 in sensor less mode, which isn’t fun, but then it finally shut down after about 4 minutes. In the final Q5 we had a new speedo and my car finally felt more normal. In practice and qualifying my car was feeling slow, so we had boosted the speedo and geared up my car. With the new speedo, my 5.5 felt more like a 3.5 and I just couldn’t time any of the jumps. After 1 crash the top guys were behind me and they were fighting for TQ, so I had to just pull over to not interfere with their opportunities. It was quite an embarrassing day, but I did manage to live through it. Here is a pic of my car before practice started. Finals day was weird. I wasn’t there with a chance to win. I started 8th in the E-main. Morning practice my car was ok, but I made some changes for the final. My car in the final felt really good in the turns, but landing was a different story. I guess what I changed really effected the landing. I could not land the triple after the straight, I would roll over every lap almost. I tried my best, but I finished 4th. 4wd was finally over. Chikuba, Kyosho designer, felt terrible. We win as a team, we lose as a team. We didn’t have a car that we thought we could win with, so we came with a prototype car hoping it would help our chances. We learned a lot, tried keeping our heads up, and we took the loss for what it is. We will be back in 2 years for 4wd revenge!!!!! 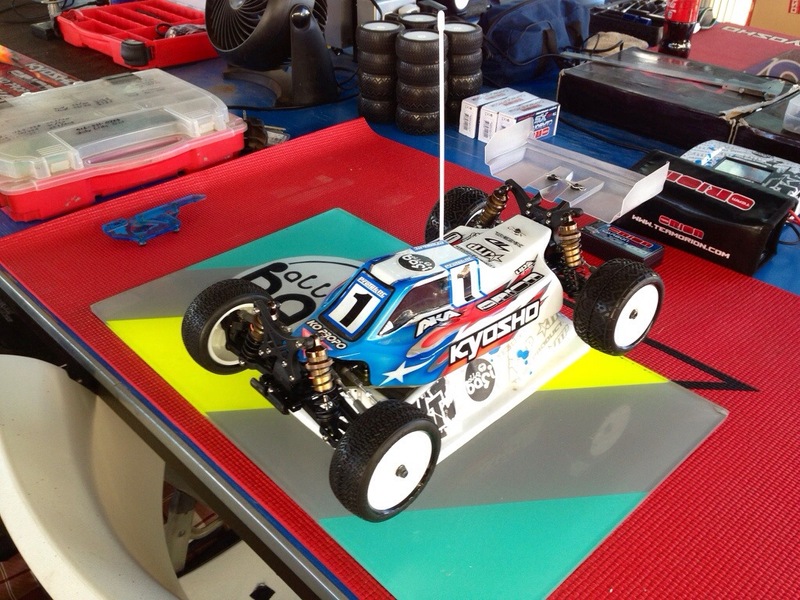 Thanks KYOSHO and Chikuba-San for all the hard work and the great support!!!!! Sorry for the lack of updates, thanks for checking back in, and God Bless. Yeah, it seemed that the prototype didn’t work for any of the Kyosho drivers. I was sure hoping it would have been great for you guys. I assume this means the ZX-6 is going back to the drawing board. Well the bright spot is your family got to see you become 2wd world champion. Thank you for the comprehensive update. Sorry to see and hear it did not go well in 4WD. You are saying it, there is another opportunity in 2015! Congratulations again on winning 2WD (it is the superior class in my opinion anyway), a tremendous achievement! Hi Jared, What is the reason for running the Aluminum Differential Shafts on your 4wd buggy in the front at some events?